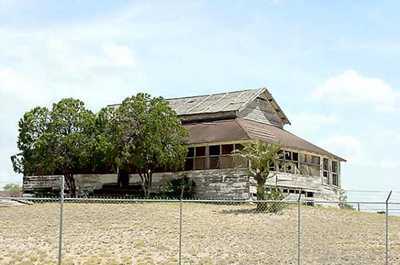 Now occupied by the Rio Grande City Independent School District, this Fort (founded in 1848 after the Mexican War was over), served as a base for protection forces during periods of bandit raids in the Border area. Named after Major David Ringgold. Established October 26, 1848, at Davis Landing by Capt. J.H. La Motte, 1st U.S. Infantry, as Ringgold Barracks. Named in honor of Brevet Major David Ringgold, 4th U.S. Artillery, who died of wounds received at Palo Alto, May 8, 1846. Troops were withdrawn March 3, 1859. Reoccupied December 29, 1859. Abandoned in 1861. Reoccupied by U.S. troops in June 1865. General Robert E. Lee passed a few days here in 1856 and in 1860. Occupied early in Civil War by Texas Confederates under Col. John S. Ford. Vital in chain of posts used to defend the 2,000 mile Texas frontier, coastline and border always threatened by attacks from Indians, bandits and Federal troops. Cols. Ford, August Buchel and Santos Benavides had troops here from time to time to scout the river, defend ranches and guard wagons trading cotton for war supplies in neutral Mexico. Taken in November 1863 by 1st Texas Union Cavalry. Retaken May 1864 by Ford and used as base to recapture Brownsville.